Tampa Bay Rowdies forward Maicon Santos, San Antonio Scorpions midfielder Zourab Tsiskaridze, and Indy Eleven defender Erick Norales all provided their clubs with a boost on Saturday night, turning in key performances to earn a spot on the North American Soccer League (NASL) Team of the Week. GK: Steward Ceus (Atlanta Silverbacks) – Coming back from a knee injury to make his NASL debut on Saturday, Ceus put in a Man-of-the-Match performance against the New York Cosmos. The Haitian international made seven saves and kept a clean sheet to help the Silverbacks stay unbeaten. The result marked the first time the Silverbacks were able to take any points away from a matchup against the Cosmos in Atlanta. DEF: Carlos Mendes (New York Cosmos) – The Cosmos posted their third shutout of the season and remained unbeaten against the Atlanta Silverbacks on Saturday. At the heart of the defense was Carlos Mendes, who was vital in keeping the clean sheet. Even with his center-back partner Rovérsio exiting due to injury, Mendes continued to command the back line in a 0-0 draw. DEF: Erick Norales (Indy Eleven) – When Carolina opted to play through the middle in the final third on Saturday, Indy’s Erick Norales was there time and time again to end the attack. Whether it was winning balls in the air or picking off passes played along the wet surface, the Honduran international was up to the task during a strong 90-minute shift against the RailHawks in a 1-1 draw. DEF: Blake Wagner (Carolina RailHawks) – After conceding an early goal and being forced to use two substitutions due to injuries in the first half, the RailHawks had their backs against the wall in rainy conditions against Indy Eleven. Late in the match, after a fine cross from Tiyi Shipalane, Blake Wagner took an adept touch before firing a shot into the top corner to tie the game and clinch an unlikely road point for Carolina. Wagner was a constant threat down the left flank and thoroughly deserved his goal. 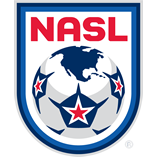 MID: Marlon Freitas (Fort Lauderdale Strikers) – Marlon Freitas’ first NASL goal couldn’t have been prettier. The Brazilian’s curling effort from distance flew into the top corner for the Strikers’ second goal in a 3-1 win over Ottawa Fury FC. Freitas, a promising young prospect on loan from Fluminense, has started the season very well and was rewarded with a goal in his fourth appearance in the Strikers’ midfield. MID: Martin Núñez (Tampa Bay Rowdies) – In his first start of the season, Martin Núñez found the back of the net, giving head coach Thomas Rongen a good reason to keep the Uruguayan veteran in the lineup. With the Rowdies trailing by a goal, Núñez struck a ball from outside the 18-yard box and found the back of the net to even the score in the Coastal Cup clash against Jacksonville Armada FC. The Rowdies would go on to find a late winner to top the Armada FC, 3-2. MID: Marcos Senna (New York Cosmos) – With a history of scoring goals – more specifically game-winners - against Atlanta, Marcos Senna again put on a vibrant display. The Spanish international tested Atlanta goalkeeper Steward Ceus on a number of occasions and was a constant threat from his midfield position. MID: Zourab Tsiskaridze (San Antonio Scorpions) – Playing in front of a sellout crowd on the road in Minnesota, Zourab Tsiskaridze quickly quieted the 9,233 in attendance. The Georgian veteran saw United goalkeeper Sammy Ndjock off his line, and rifled a 65-yard shot into the back of the net with the accuracy of a true marksmen. Perhaps the wildest part is that Tsiskaridze has scored a similar goal before, finding the net from inside his own half while playing in Sweden several years ago. FWD: Pablo Campos (Minnesota United) – After suffering an injury in 2014, Pablo Campos needed to get back to his scoring ways. Entering the match against the San Antonio Scorpions, Campos’ last goal came on November 2, 2013. Against his former team, that goalless period was erased. The beneficiary of some great individual effort and cross by Miguel Ibarra on the flanks, the Brazilian forward scored on a powerful header in the first half of a 2-2 draw. FWD: José Angulo (Fort Lauderdale Strikers) – After narrowly missing out on his first goal in Week 3 against FC Edmonton, José Angulo finally found the net last Saturday, scoring twice against the league’s other Canadian team, Ottawa Fury FC. Angulo was instrumental in the Strikers’ 3-1 win, scoring his first NASL goal just before halftime and following that up with his second just before the final whistle. FWD: Maicon Santos (Tampa Bay Rowdies) – In his second appearance for the Rowdies, Brazilian veteran Maicon Santos sure left his mark on the match. He opened the scoring from the penalty spot, and then with the scored tied at 2-2, the 31-year-old forward nodded home the game-winning goal in a thrilling comeback victory. 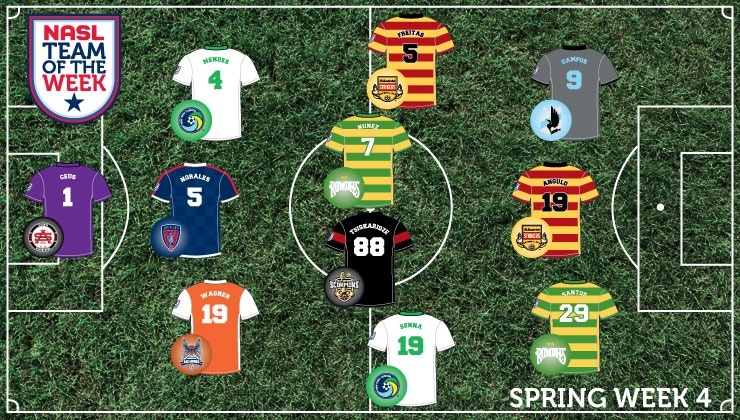 Santos took home NASL Player of the Week honors for his performance.